In pretty much every post so far this month I've at least made a quick mention of what a pain my skin has been lately. I flew to Michigan for work at the end of August, and my skin has been paying the price ever since. 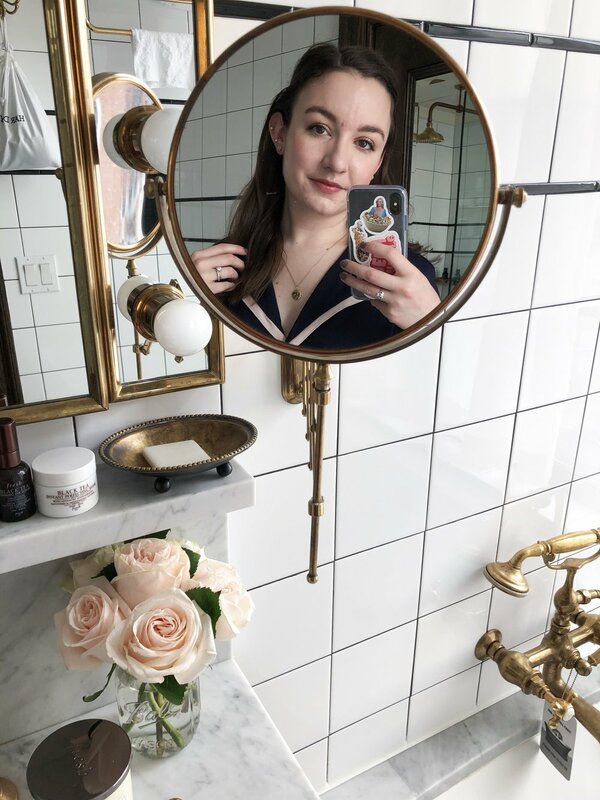 Through lots of trial and error this month, I've found the products that have really been helping to soothe my skin and get it back to normal. The Mask | I've wanted to do some kind of detox mask every day to just get all the gunk out of my skin faster, but I've refrained. I have found that the L'Oreal Detox & Brighten Pure Clay Mask has been working really well to vacuum out my pores. I've been using it a couple times per week and it keeps my skin decongested and has been helping clear breakouts. It also doesn't leave my skin feeling dry or tight which is a plus, as many clay masks will do that to my easily-dehydrated skin. It's a thick and creamy consistency that's easy to spread over the skin, but it is a bit of a pain to wash off. The results are worth the time though. The Serums | I've already proclaimed my love for all three of Glossier's new serums, The Supers, here, but so far Super Pure has been the standout. It's a niacinamide and zinc serum that helps to calm redness and heal breakouts. It instantly feels cooling and soothing on my skin so I haven't been able to resist slathering a few drops on every night after washing my face. I wake up in the morning with less redness and less angry-looking spots, so I'm in love. The other "serum" is a little bit of an in-between product - I tend to use it more as an oil. The Kiehl's Midnight Recovery Concentrate has been hyped up for the longest time and for good reason. This is another product that feels nice and soothing on the skin due to the lavender oil it contains. It's really lightweight so it doesn't clog up the skin, but it's still as moisturizing as an oil. I love following this one up with a cream to lock everything in. The Oils | I've got two oils I am loyal to when my skin is freaking out - an active one to help cure my skin's ailments and a gentle one when my skin just needs to be soothed. I'll never stop raving about the Sunday Riley Luna Sleeping Night Oil as it's been worth every bit of hype for me - I see instant results every time I use it. It gets rid of redness, reduces the size of my pores, and helps clear breakouts. The gentle oil I always run back to is the Indie Lee Squalene Facial Oil. It's so lightweight that it just smooths over the skin and starts getting the moisturizing done. No matter how my skin is feeling, this is one I turn to. The Cream | I first found out how much my skin loves the Sunday Riley Tidal Brightening Enzyme Water Cream* when it's having a meltdown because I typically use it after the Luna oil. It has a cooling feeling as it's a gel-cream, so it feels quite soothing right away. It works perfectly in tandem with the Luna oil to even out the skin. What products do you reach for when your skin is throwing a tantrum? Remember you can shop through glossier.com/reps/kelsey for 20% off your first order! Details here. *Product mentioned has been sent to me for consideration, but all opinions are my own. Please see my disclaimer for more information.